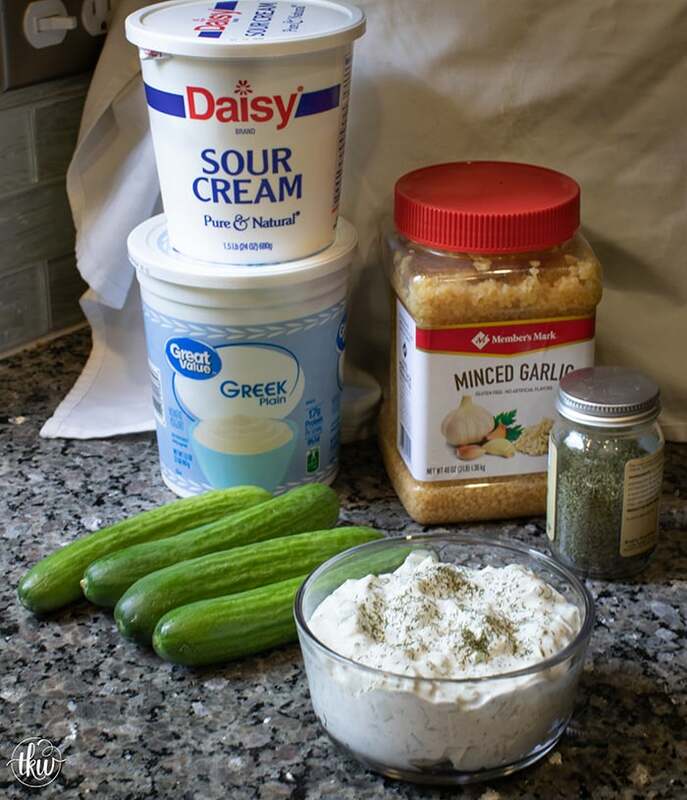 Tzatziki Sauce is a creamy Greek yogurt sauce with English cucumbers and fresh garlic. Combined with lemon, fresh dill it’s the perfect accompaniment for gyros, burgers, pita bread and most Mediterranean dishes! Plus it’s ready in minutes! When we had our pizza shop, while we were known for our pizza, we were also known for our fresh gyros. We had this huge gyro spinning machine where the gyro cones spun slowly around a heated rod slowly roasting and cooking the gyro meat. In a pizza shop that was always crazy hot, the gyro machine made it even hotter. But the customers LOVED it. We made everything from traditional gyro pita sandwiches to gyro pizzas, gyro subs, gyro calzones and gyro salads. With all those gyros we went through a TON of gyro sauce. To be honest, for years I refused to eat it as I was so burnt out on spooning it into 2 ounce cups plus it reminded me too much like mayo and y’all know how much I hate mayo. When the pizza shop closed I was pretty happy that I wouldn’t have to be near gyros or gyro sauce ever again as I honestly was just burnt out from it. But then, love happened and Mr. Fantabulous came into my life who loved gyros. *sigh*. The gyro and gyro sauce was back in my life. The things we do for love! The first thing I had to do was come up with a gyro sauce (Tzatziki sauce to be accurate). Most know it as gyro sauce as Tzatziki is tough to say for some. This recipe is only a handful of ingredients and you have 2 choices – His and Hers recipes. You see *I* prefer traditional with the Greek yogurt, English cucumbers (though mini cucumbers like those in the pictures can be used too), and some seasoning. He is well, odd. He hates it with yogurt and prefers it with sour cream as that’s how Mama Fantabulous made it. Though it’s funny as she used my recipe but didn’t have Greek yogurt on hand and used sour cream. There’s really no difference other than Greek yogurt has a bit more zing to it. But he apparently loves the Sour Cream version. This recipe comes together in only a few minutes – seriously peeling/chopping the cucumbers is what takes the most amount of time. Oh… so one thing I want to mention is about the cucumbers. In the recipe you have 2 choices – you can chop it up small or you can grate it. I personally like it chopped super small as I like the texture. I found that when you grated it made it, even after pressing the liquid out, it got lost in the dip. There wasn’t really any texture. But if you don’t want the texture, you can totally grate it but you have to press out as much liquid as possible. So if you have 15 minutes then you have one amazing dip that is great in countless recipes and perfect on any food party table! In a bowl add the yogurt (or sour cream), garlic, lemon juice, salt, pepper, olive oil and dill. Mix to combine and set aside. Mince the cucumber into small pieces, add to the yogurt mixture and then stir. You can grate the cucumber if you wish but place it in a strainer first with a pinch of salt and press gently to release the liquid. Mix the grated cucumber into the yogurt mixture. Chill for at least 1 hour. To serve, give it a quick stir first. Store for up to 3 days in the fridge. Loved the tzatziki. So quick and easy. Put it on my chicken burger last night. What to put it on next! Yeah! So happy you loved it Roberta! Thank you! Made this last night with the sour cream and I have to admit, I like it better than with the yogurt! Amazing recipe Lori! Thank you so much Rich! I really appreciate it! I was last summer in Greece! I love the Tzatziki sauce! This is an easy recipe! Thanks for sharing! I’d love to visit Greece! Some day! Looks very good and easy. What volume of cuke are you asking for, about 1 cup? Obviously, the little minis (I think they’re called Persian cukes on this coast) won’t make enough if you use half of one of them. Just updated it! When you mince/small chop the cucumber you’re looking for 3/4 cup of a cup. Yes, Persian cukes. I updated the recipe to say how many you need. It’s super simple and I like that you have a choice of either sour cream or yogurt. The only thing, make sure they are both full fat. The light/fat free don’t offer the right taste and they are too thin for this recipe.